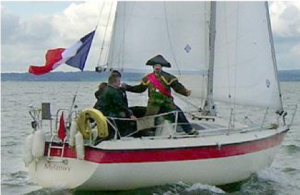 Our annual Trafalgar Rally season finale will take place on Saturday 19th October and have three elements: We will start with a battle, where the boats are split into two fleets: The British and the French / Spanish. Armed with water pistols / bombs / secret water-based armaments of your choice, the fleets will line up against each other and points will be scored for each successful hit. This will be followed by a short pause, then there will be a sailing race, where points will be scored for position. Finally, points will be scored for the best dressed boats and crew, which will be judged during the battle (so you can lower some of your decorations for the race if they are causing trouble!). Fancy dress is most definitely encouraged. There will be a briefing at the club at 21:00 on Friday evening and the event itself will most likely take place at or near C1 / C2, weather permitting. The race will start after the battle. In the evening, there will be a dinner in the club, click here to sign up.